Posts categorized "▪ 2006 in review"
As a way of saying "aloha" to 2006, I've summarized the land use law highlights (or lowlights, depending on your point of view) from the Hawaii Supreme Court, the Ninth Circuit, and the U.S. Supreme Court, roughly in chronological order. Topics include shorelines, eminent domain, environmental impact statements, RLUIPA, vested rights, and land use litigation procedures. If you think I missed any key cases or events, please email me. On Christmas Eve 2006, the Honolulu City Council approved a $4B+ "fixed guideway" mass transit system to run from somewhere in West Oahu to somewhere in town. The nature of the system has not been selected (rail, busway, something else), nor has the route. But in January 2007, a half-percent increase in the general excise tax became effective, the proceeds from which are earmarked for the transit system. City officials say it's a "go." I've made a few comments about the impact of a mass transit project on property owners (here, here, here, and here), but it is too early in the process to note any concrete legal developments. I've included the fixed guideway story in 2006's land use highlights, however, since I suspect the legal issues will loom larger and larger as the project -- the largest public works project in Hawaii's history -- moves forward. The most recent case involving the long-standing controversy over the Waiahole Ditch, In re Water Use Permit Applications, ___ Haw. ___, 147 P.3 836 (Nov. 29, 2006) was not the usual blockbuster opinion or the latest in water rights, interim instream flow standards, and the public trust doctrine. Indeed, it was an unsigned per curiam decision. But I have included it within 2006's highlights simply because it illustrates the new appellate procedures in Hawaii state courts. Until the new procedures which became effective in July 2006, Hawaii state court cases had a unique appellate track. After a trial court entered judgment, all appeals were made to the Supreme Court of Hawaii, which then assigned cases to the Intermediate Court of Appeals. If a litigant was not satisfied with the decision from the ICA, she could seek review in the Supreme Court by way of an application for a discretionary writ of certiorari. Most cases, however, were not assigned from the Supreme Court to the ICA, and the high court routinely disposed of most appeals. The "up-then-down" procedure was unwieldy and an anachronism, a leftover from the days before the legislature created the ICA, and all appeals were straight to the Supreme Court. The procedure also was a factor in creating a backlog of appeals on the Supreme Court's docket. In July 2006, however, new jurisdictional statutes became effective, resulting in the ICA having primary appellate jurisdiction over all appeals, with the Supreme Court retaining discretionary certiorari review. Apparently, however, the drafters at the legislature did not catch all of the language regarding appellate jurisdiction scattered throughout the Hawaii Revised Statutes. For example, the Water Code still states that appeals from contested case decisions by the Commission on Water Resource Management are made "directly to the supreme court." After CWRM issued (yet another) order in the contest over the water in the Waiahole Ditch in July 2006, a party noticed its appeal on August 11, 2006 with the Supreme Court, even though the new appellate structure had become effective the month before. Understandable, for considering the plain language of the Water Code, what else should the litigant have done? The Supreme Court ordered the case transferred to the ICA, holding that the legislature's failure to amend the Water Code language was merely an oversight since it amended fifth-three other sections in the statute books relating to appellate jurisdiction, and that the legislature no doubt intended to amend the Water Code as well. Lesson? File all appeals with the ICA. It will be helpful after a few years under this system to see if the Supreme Court as a purely discretionary body experiences a shrinking of its docket, and a speedier process from filing to disposition. It would be helpful to those of us who practice appellate law, for example, to establish criteria for when a decision by the ICA is "certworthy" and likely to be reviewed by the Supreme Court. Hawaii has only one ICA, so there are no circuit or district "splits." If the Supreme Court is simply to be yet another level of appellate review for dissatisfied litigants without clear standards for when it would be worthwhile to seek review, why does anyone think this will significantly decrease the court's workload? Taking up the Supreme Court's suggestion that state law was the means to protect property from eminent domain abuse, state legislatures and local governments around the country began restricting how the condemnation power has been exercised. State courts have also taken up the challenge, the biggest development in 2006 being the City of Norwood v. Horney decision from the Ohio Supreme court. That case held that economic benefit standing alone will not support a claim of public use under the Ohio Constitution. The court also held that a blight designation was too vague to have any legal force, and violated the Ohio Constitution. Now, if only Mrs. Kelo and other property owners subject to overaggressive use of eminent domain could move their properties to Ohio or Michigan. In the November 2006 election, several states passed eminent domain reform by constitutional amendment or initiative. New Jersey Eminent Domain blog posted a summary of the election results. These results tell me that property rights in general, and eminent domain reform specifically, are topics that have some traction and may cut across political lines. None of these approaches has yet been adopted by the Hawaii Legislature, the Hawaii courts, or Hawaii voters. How come? The legislature had before it at least four proposals to reform eminent domain, and not one made it out of committee. Hawaii appellate courts have not yet been confronted squarely with the issue, which did not arise in the one major eminent domain decision issued by the Hawaii Supreme Court in 2006. Finally, initiative is not available in Hawaii on matters of state law, or locally on matters of statewide concern, so there is no possibility of Hawaii voters having a chance to directly enact eminent domain measures if the legislature refuses to do so. One of 2006's bigger cases was Diamond v. Bd. of Land and Nat. Res., 112 Haw. 161, 145 P.3d 704 (Oct. 24, 2006), involving the location of the "shoreline" for purposes of determining the buildable area on an oceanfront parcel. There was news coverage a-plenty, and I posted more than a few comments on the case and on the coverage. Start here, then read this, this, this, then this post. I'd bet this case will have lasting impact, even though it was not about the public-private boundary, and only analyzed the location of the "shoreline" under Hawaii's Coastal Zone Management Act. 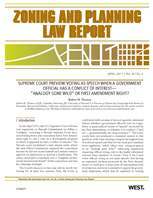 In September, the ABA Section on Litigation (Committee on Condemnation, Zoning and Land Use) published Law and Procedure of Eminent Domain in the 50 States, a state-by-state summary of each jurisdiction's eminent domain laws and cases. I authored the chapter on Hawaii. Topics covered include who has the power to take, sources for condemnation authority, the rules of just compensation, and the procedural aspects of eminent domain litigation. The individual state chapters, mine included, are posted for download for ABA members here. Revisiting the RLUIPA issue, the Ninth Circuit held in Guru Nanak Sikh Society of Yuba City v. County of Sutter, 456 F.3d 978 (9th Cir., Aug. 1, 2006) that a local land use decision regarding a church's proposed use of its property violated the federal Religious Land Use and Institutionalized Persons Act of 2000. While it is not a groundbreaking case, it illustrates the competing dynamics when a church's desires to use its property clashes with local land use rules. My summary of the case is posted here. I commented upon the decision in Hui Kakoo Aina Hoopulapula v. Bd. of Land and Nat. Res.,112 Haw. 28, 143 P.3d 1230 (Sep. 21, 2006) earlier in this post. This opinion, detailing when and how a contested case may be demanded, should be read together with Aha Hui Malama O Kaniakapupu v. Land Use Comm'n, 111 Haw. 14, 139 P.3d 712 (July 24, 2006) and Keahole Defense Coalition, Inc. v. Bd. of Land and Nat. Res., 110 Haw. 419, 134 P.3d 585 (May 18, 2006). ▪ 2006 Land Use in Review: Who Protects the Public Trust? The "public trust" doctrine got a further boost in Kelly v. 1250 Oceanside Partners, 111 Haw. 205, 140 P.3d 985 (July 28, 2006). The public trust doctrine in its original form under Hawaii law was that the Crown or government owns title to all land below the high water mark, which is held in trust for the people for navigation and other public purposes. In other words, land under the ocean is a public resource, and incapable of private ownership. This doctrine has historical roots in American and English common law. In more recent times, that ancient doctrine was expanded when the courts, following the suggestion of influential academics, began using the doctrine to justify finding that more and more resources were subject to the trust, and therefore not private property. While there is some debate about whether the public trust affects ownership of property subject to the trust, the doctrine was expanded to cover all water resources (not just submerged land), new land formed by lava flows, and beachfront land makai of the high wash of the waves. These forms of property, the court determined, was held in trust by the government as a public resource, to be protected for "future generations." The Kelly case, however, was not about further geographic expansion of the public trust, as it involved waters well within the scope of the original doctrine -- nearshore ocean waters, which the parties did not dispute were subject to the trust. Rather, the question before the court was the scope of the duty imposed by the trust, namely which government entity has the obligation to enforce and protect the trust. The background facts: After heavy rains caused a landowner's erosion control measures to fail, dirt and other runoff ended up in the nearby ocean. The plaintiffs asserted, among a litany of claims, that the County of Hawaii had a public trust duty to prevent the runoff and water pollution since it had allowed the landowner to grade its property as part of a large scale luxury development. The plaintiffs also alleged that the landowner violated the terms of a water pollution control permit issued by the State of Hawaii Department of Health. The County did not contest the existence of a public trust duty to protect nearshore waters, but argued it was the State's duty, not the County's. The court disagreed, holding that the Hawaii Constitution requires all governmental entities, including the state and "political subdivisions" to "conserve and protect Hawaii's natural beauty and natural resources." Haw. Const. art. XI, § 1. The court noted that the terms "political subdivision" and "county" as used in the constitutional text are straightforward, and expressly command both the State and County governments to affirmatively protect public trust resources. The court held, however, that despite the existence of this duty, the plaintiffs had not proven the County breached it. Additionally, the court determined that the state's duty to protect the public trust went beyond simply enforcing its statutes. The court held that the government has the obligation at "every stage" of the planning process to "take the initiative" in protecting the resource, and its role goes beyond that of a "mere umpire." While the decision was, technically, a win for the State and the County (the court found that neither breached their duties in this case), it certainly does not forecast an easier future for governments or especially for property owners who wish to exercise their constitutional right to make reasonable use of their land. By adding yet another layer of regulation with a constitutional nature -- while leaving the standards very amorphous -- Kelly has further complicated the land use process with little guidance to governments or property owners. In Aha Hui Malama O Kaniakapupu v. Land Use Comm'n, 111 Haw. 14, 139 P.3d 712 (July 24, 2006), the court set forth the standard for when an agency hearing is a "contested case" under the Hawaii Administrative Procedures Act (HAPA). The definition is critical because unless a contested case has been conducted by an agency, a circuit court will have no subject matter jurisdiction to consider an appeal from the agency's decision. A group opposed to a landowner's use of its property argued that conditions imposed by the Land Use Commission in its earlier approval of a boundary amendment had not been complied with by the landowner. The group filed a motion for an order to show cause why the boundary amendment should not be revoked. The LUC held a hearing and denied the motion. The group appealed to the circuit court under HAPA. The hearing determines the "rights, duties, or privileges of specific parties." The court held that the LUC was required by its rules to hold a hearing on motions when requested by a party, and that the first part of the above test was satisfied. However, the hearing did not determine the objecting group's rights, only perhaps the rights of the landowner, so the second part of the test was not met. If the LUC had granted the motion and held a hearing on the order to show cause, then the result would have been different, as that hearing would be a "contested case." 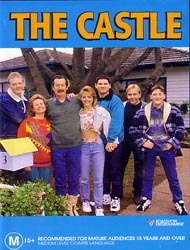 Lastly, the Hui argues that, "[i]f the [c]ircuit [c]ourt has no jurisdiction to determine if an appellant were entitled to a contested case hearing after having requested one, any agency could arbitrarily and capriciously deny anyone a hearing at any time, regardless of whether such hearing were required by law, and the aggrieved party could never obtain judicial review of such denial." However, in this case, the Hui did not request a contested case hearing. Indeed, the Hui concedes that "there is no procedural vehicle for '[a]ny party or interested person' to obtain a contested case hearing on whether a petitioner has failed to perform according to the conditions imposed or has failed to perform according to the representations or commitments she made[.]" Consequently, the Hui's assertion is without merit. To the court it is simple: no contested case, no judicial review (at least under HAPA). In Jones v. Flowers, 547 U.S. ___ (Apr. 26, 2006), the U.S. Supreme Court answered the question of what further obligation the government has to provide a property owner notice of an impending sale of his property when a certified letter is, in the words of the classic Elvis song, "Returned to Sender." The opinion answered whether the Due Process Clause of the U.S. Constitution requires a state to take additional reasonable steps to notify a property owner of an impending tax sale if a written notice is returned undelivered. Mr. Jones didn't pay his property taxes. The State of Arkansas, like most government entities, did not appreciate Mr. Jones' oversight, and after several years of such behavior, sent him a certified letter informing him that if he didn't pay up, his house would be sold. Mr. Jones, however, had moved out of the house, so he didn't get the letter, which was returned to the state "unclaimed." The state, hearing no response from Mr. Jones, published a notice in the newspaper and sold the house. Jones sued, asserting that the Due Process Clause of the Fourteenth Amendment requires the government do something more if a certified letter is returned undelivered. The Court agreed, holding that the state should have taken additional steps to provide Jones with actual notice. It is not sufficient to send a letter that is returned undelivered and to publish a notice in a newspaper. The "government must take additional reasonable steps to provide notice before taking the owner's property." Due process does not require that a property owner receive actual notice before the taking, but the notice the government provides must be "reasonably calculated" under the circumstances to apprise the party of the pendency of the action and provide them an opportunity to object. The key fact in the case was that the government knew its attempt to provide notice by certified mail had failed, since the letter was returned undelivered. The government had an obligation, the Court held, to do something more, such as resend it by regular mail. The Court did not define the outer limits of what due process requires, only that the State of Arkansas had not done enough before the forced sale of a person's home and property. In the Court's words, "I tried" is not good enough. Elvis would be proud. Rapanos v. United States, 547 U.S. ___ (Jun 19, 2006) was this year's big environmental case from the U.S. Supreme Court, yet it did little to resolve the question over the geographic scope of "navigable waters" as used in the Clean Water Act. The CWA requires a property owner seek a permit from the Army Corps of Engineers prior to any activity that may involve "navigable waters of the United States." The facts of the case are set out here. The Court split 4-4-1, holding to overturn the decision of the Corps to require a Michigan landowner to seek a permit, but could not agree on a rationale. The plurality decision left most commentators scratching their heads, unsure of what the rule of law was in the wake of the decision, and how to apply a ruling on which there was no majority opinion. As in last term's Kelo and Lingle cases, Justice Kennedy issued a separate opinion that may forecast the eventual majority rule of law. Since I first wrote about the Rapanos decision, the issue has not become any clearer. The lower courts are split as to how to apply the various opinions, and how to analyze CWA jurisdiction. Another landowner caught up in the CWA net has asked for cert review, that as of this post, has not been acted upon by the Court. Until the Supreme Court resolves the question, the lower courts will be as confused as the commentators, and property owners who may be affected remain in legal purgatory. In Keahole Defense Coalition, Inc. v. Bd. of Land and Nat. Res., 110 Haw. 419, 134 P.3d 585 (May 18, 2006), the Hawaii Supreme Court elaborated on the issue of when a party has "property" within the meaning of the due process clause of the Hawaii Constitution. The twisted procedural history of the case is not worth repeating in detail. Suffice it to say that the appellant claimed that a state-issued license to provide telecommunications service was "property" protected by article I, section 20 of the Hawaii Constitution. "Standing" is a jurisdictional doctrine - no standing, no jurisdiction. Important because: the lack of standing can be raised at any time in a case. The test for standing to appeal is somewhat different than other standing tests: the person must have been a party below, must have had standing in the trial court to oppose the order appealed from, and must be affected or prejudiced by the order. The "standing" doctrine and the concept of due process "property" are intertwined, and what the court characterized as an economic interest, standing alone, does not constitute "property." With no property at stake, the appellant did not have standing to participate. The court tied the standing and property issues together by holding that even if the license was property, the appellant did not show how its license would be affected by the acts complained of. In other words, the appellant did not demonstrate a concrete injury that could be remedied by a judicial decision. This case should not be misread to say that a license never can be "property," since in this case, the state agency with the authority to issue the license retained the discretion to not issue it. It would have been an entirely different matter, for example, if the license had been issued. Just in case you were wondering whether Hawaii water rights issues were matters of federal or state law, the Hawaii Supreme Court has provided the answer. In Maui Tomorrow v. State of Hawaii, 110 Haw. 234, 131 P.3d 517 (Apr. 5, 2006), the court held that prevailing on a state law water rights claim in state court does not entitle the victor to federal civil rights attorneys fees. That conclusion may seem a touch obvious, one might think, but despite a rather clever and "tenuous" argument by the party seeking to fee-shift, the court correctly determined that issues of water rights and the common law public trust were matters of state law. Disclosure: I represented the Hawaii Farm Bureau Federation, one of the prevailing parties in this appeal. The appeal arose when the owner of a private water transport system on Maui sought a long term lease from the State Board of Land and Natural Resources, allowing the use of surface water originating in state-owned land. Several individuals and organizations intervened in the administrative process, alleging that the lease would interfere with their preexisting water rights, rights as Native Hawaiians, and rights under Hawaii's public trust in water, and that before entering into a lease, the agency must undertake an environmental assessment under the Hawaii Environmental Policy Act, Haw. Rev. Stat. ch. 343. The agency rejected the claims, and the intervenors appealed to state court, adding a claim for due process violations. The trial court ruled against the intervenors and in favor of the state on the due process claims, for the intervenors on the EA and public trust claims, and remanded the case back to the agency. After judgment was entered, the intervenors sought nearly a quarter of a million dollars in attorneys fee under the federal fee-shifting statute, 42 U.S.C. § 1988. That statute allows a party who prevails on a federal civil rights claim (42 U.S.C. § 1983) to make the loser pay attorneys fees. The trial court denied the motion and the intervenors appealed. The Supreme Court held that despite characterizing their water rights and public trust claims as claims under the law admitting Hawaii as the 50th state (the Admission Act), the claims made by the intervenors were, in reality, arguments under state law. The court compared the claims actually made by the intervenors to the claims the intervenors said they made, and found no federal civil rights claim was present, much less a federal claim on which the intervenors prevailed. The court characterized the request for attorneys fees as "tenuous," but refused to impose Rule 11 sanctions for a frivolous argument. A touch of self-promotion. In February 2006, the University of Hawaii Law Review published an article written by me and my Damon Key colleagues Ken Kupchak and Greg Kugle. 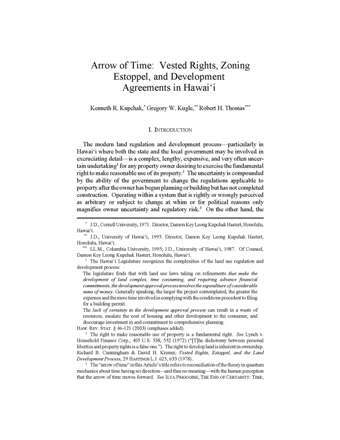 The title "Arrow of Time: Vested Rights, Zoning Estoppel, and Development Agreements in Hawaii" pretty much sums up the contents. The article seeks to answer the question: can the government change its mind after it gives a property owner the "green light" to develop? Details, including how to obtain a copy, here. City & County of Honolulu v. Sherman, 110 Haw. 39, 129 P.3d 542 (Feb. 28, 2006), is the latest chapter in the use of eminent domain to effect "land reform" in Hawaii. The story begins long ago when the Hawaii legislature enacted the statute that was challenged and sustained in Hawaii Hous. Auth. v. Midkiff, 467 U.S. 229 (1984). Finding that the economic ills purportedly caused by the concentrated ownership of private single-family residential property in Hawaii, Haw. Rev. Stat. ch. 516 allowed homeowner/lessees to petition the Hawaii Housing Authority to exercise eminent domain on the homeowner's behalf and condemn the fee simple interest underneath their homes from the lessor, and transfer it to the lessee upon payment of just compensation. After that statute was upheld by the U.S.Supreme Court against a Fifth Amendment public use challenge in Midkiff, and under the Hawaii Constitution's public use clause by the Hawaii Supreme Court in Hawaii Hous. Auth. v. Lyman, 68 Haw. 55, 704 P.2d 88 (1985), efforts were made to pass similar legislation affording condominium owners the same ability to force condemnation of their leasehold interests. At the state level, those efforts were ultimately unsuccessful, but the City & County of Honolulu eventually enacted a local version, codified as Hon. Rev. Ord. ch. 38. That ordinance, like the Land Reform Act, was challenged under the public use clauses of the U.S. and Hawaii Constitutions, but as in Midkiff and Lyman, those challenges were rejected by both federal (Richardson v. City and County of Honolulu, 124 F.3d 1150 (9th Cir. 1997)) and state courts (Richardson v. City and County of Honolulu, 76 Haw. 46, 868 P.2d 1193 (1994)). Under chapter 38, the owners of many Honolulu condominium projects were permitted to condemn and take the leasehold interests from their lessors. By 2005, however, public sentiment regarding eminent domain had turned, and the City Council surprisingly repealed chapter 38. The story does not end there, however, because at the time of repeal, several condominiums had begun the process to condemn their leaseholds, and were entitled to continue. Sherman involved one of those condominiums in the process of condemnation. In that case, the apartment owners petitioned to condemn the leasehold interest from the owner, a church, which raised the federal Religious Land Use and Institutionalized Persons Act (RLUIPA) as a defense, asserting that the lease-to-fee conversion was a "land use regulation" that impermissibly interfered with the church's free exercise of religion. The trial court denied the church the opportunity to prove these allegations, ruling against it on a motion for summary judgment. Relying on federal cases, the Hawaii Supreme Court held that chapter 38's condemnation scheme was not a "land use regulation" as defined by RLUIPA, and the defense was therefore unavailable. The text of RUIPA defines "land use regulation" as a "zoning" or "landmark" law. There is a split of federal authority on whether an exercise of eminent domain is a "land use regulation," with most courts holding that a typical condemnation of property that is owned by a religious organization does not trigger RLUIPA, while a few other courts disagree. It does seem odd for Congress to have excluded an outright appropriation of a church's property, while requiring strict scrutiny for mere regulation. If onerous regulatory decisions should be judged strictly by the courts to insure they do not interfere with the free exercise of religion, how is that actually depriving a church of its property should be immune from such scrutiny? Alas, such questions are not the province of the courts -- especially state courts -- and despite the apparent logical gap in RLUIPA, it is up to Congress to amend the statute, not the courts, so the Hawaii Supreme Court's decision appears sound. The court also rejected the church's claim that the City improperly delegated the power of eminent domain to the City Department of Community Service. The church argued that even though the City Council ultimately had the duty to approve chapter 38 takings, the DCS and the lessees were, in reality, the parties that actually determined what property was to be condemned. The court did not really address the church's argument, holding instead that the legality of delegation to DCS had already been decided in a prior case, Richardson v. City and County of Honolulu, 76 Haw. 46, 868 P.2d 1193 (1994). In that case, the court had reviewed the chapter 38 procedures and held that DCS "merely" designated property, and it was the City Council's ultimate decision whether to actually take it. While that may be how chapter 38 was designed to work, the church alleged the reality was much different, and once DCS and apartment owners designated property, the City Council would never be anything more than a "rubber stamp." The church was denied the opportunity to support that argument with evidence, however, because the Supreme Court upheld the trial court's grant of summary judgment to the City. Thus, under Sherman, it seems not to matter what actually happened in the decision whether to take property, but only what the law states is supposed to happen. If read to apply broadly, this conclusion does not hold up to the standards of Kelo v. City of New London, particularly the warning in Justice Kennedy's concurring opinion that an exercise of eminent domain is not automatically immune from judicial review, and plausible allegations of extra-legal conduct must be taken seriously. Thus,Sherman must be read narrowly in the context of the facts of the case; the property owner only alleged that the delegation violated Haw. Rev. Stat. § 101-13, and Haw. Rev. Stat. § 101-14, not that the delegation violated federal and state constitutional standards. That issue, apparently, must be decided in some other case. Finally, the court addressed technical issues of the City's compliance with chapter 38, and the number of apartment owners who qualified for conversion, but since the ordinance has been repealed, this analysis holds little current interest. If you need to know more, it's best to read the opinion. In the end,Sherman will probably not be remembered as a landmark eminent domain case, since it dealt primarily with an ordinance that had already been repealed. But the two key issues in Sherman are sure to arise again, as governments become even more aggressive taking property in the wake of Kelo -- including church property -- and more willing to delegate that authority to third parties. When is the "earliest practical time" to prepare an environmental assessment under Hawaii's environmental statutes? In Sierra Club v. State of Hawaii Office of Planning, 109 Haw. 411, 126 P.3d 1089 (Jan. 27, 2006), the court determined if and when an environmental assessment is required during the boundary amendment process. The property owner asked the State Land Use Commission to amend the land use classification from "agricultural" to "urban" to permit it to develop the "Koa Ridge" project in central Oahu. This procedure, known as a "boundary amendment," is required by Hawaii's top-down system of land use, under which the State classifies all land into one of four categories: agricultural, conservation, rural, or urban. Only then are the counties permitted to separately zone the land classified as urban. The "boundary amendment" process, despite its unusual moniker, is similar to a rezoning. The Sierra Club and others intervened in the petition process, arguing that before the LUC was permitted to grant the boundary amendment, the agency must have completed an Environmental Assessment under the Hawaii Environmental Policy Act, Haw. Rev. Stat. ch. 343 to determine whether a full-blown Environmental Impact Statement was required. Section 343-5 of HEPA requires an agency to undertake an EA if an applicant proposes the "use of state lands." The intervenors claimed that the Koa Ridge project would do so because it contemplated construction of a sewage and water lines which would require tunneling under state-owned land. The landowner agreed that an EA was required, but argued it could be accomplished later because section 343-5 requires only that the agency prepare the EA "at the earliest practical time." The landowner asserted it was too early in the process to accurately set out the possible environmental impacts since the project at the boundary amendment stage was preliminary and conceptual, and the end product might be different. We agree with the reasoning of Citizens [for Prot. of N. Kohala Coastline v. County of Hawaii, 91 Haw. 94, 979 P.2d 1120 (1999)] that early environmental assessment comports with the purpose of HEPA to alert decision-makers early in the development process because, "[a]fter major investment of both time and money, it is likely that more environmental harm will be tolerated." The court did not address what would happen if, as the landowner predicted, the scope of the project was altered in the future, either on the landowner's initiative, or in response to a requirement from the LUC, which has the discretion to impose conditions on boundary amendments. Under the court's reasoning -- environmental information is "important," and care must be taken to insure that the agency's decision to approve is not a foregone conclusion -- it is not difficult to imagine that yet another EA could be required. When a statute or ordinance states that an agency "shall" do something, but because of practical limitations or longstanding practice the agency does something else, what will a court do about it? Leslie v. Board of Appeals, County of Hawaii, 109 Haw. 384, 126 P.3d 1071 (Jan. 25, 2006) involved the meaning of the word "shall" in statutes and regulations and how statutory language may or may not be affected by how the government implements the law. The decision also involved the meaning of the term "development within the SMA" as used in Hawaii's Coastal Zone Management Act.